In 1840 the first P&O passenger vessel sailed into Southampton and marked the start of what was to become the cruise capital of the UK. 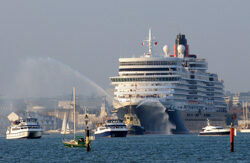 Today increasing numbers of ships are calling into Southampton with over 450 cruise calls. Southampton cruise terminals play host to a wide variety of cruise lines including Royal Caribbean, Celebrity Cruises, P&O Cruises, Princess Cruises, Cunard Cruises, Fred. Olsen and MSC Cruises. Associated British Ports (DHB) have invested over £40 million in its four dedicated cruise terminals and surrounding infrastructure. Taking a cruise means no waiting around at busy airports, no confusing restrictions on hand baggage, unlimited cabin baggage and your holiday starts as soon as you arrive in Southampton. Park, stay and cruise packages are offered by a wide range of hotels across the city as well as the surrounding area, enabling visitors to stay in the city before or after their cruise whilst allowing parking and assisting with travel arrangements to and from the cruise terminals. Dock Gate 4 is 1 mile from the Terminal. Both Southampton Railway Station & the coach station are 1 mile from Dock Gate 4. Southampton Airport is approximately 5 miles away. Southampton is serviced by the M3 and M27, with the Port well sign posted. Telephone Number: 023 8033 2389. A short stay car park is available adjacent to the Terminal. There is a dedicated taxi rank outside the Arrivals Hall. A fully licensed bar and café is available in the Departure Lounge, after check-in. Visitors’ refreshment facilities are limited. The viewing gallery is not open to visitors. Dock Gate 10 is less than a mile from the Terminal. Both Southampton Railway Station & coach station are ½ mile from Dock Gate 10. Southampton Airport is 5 miles away. Southampton is serviced by the M3 and M27, with sign posts to the Docks. Terminal telephone number: 023 8033 0106. A short stay car park is available adjacent to the Terminal. CPS valet parking service is available from this Terminal. There is a dedicated taxi rank outside the Arrivals Hall. A fully licensed bar and café is available in the Departure Lounge, after check-in. Rest rooms and refreshment facilities are available in the Arrivals Hall. Dock Gate 10 is 500 yards away from the Terminal. Southampton Central Railway Station & the coach station are approximately 1 mile from Dock Gate 10. Southampton Airport is 5 miles away. Southampton is serviced by the M3 and M27, with the Port well sign posted. Terminal telephone number: 023 8071 0175. A short stay car park is available adjacent to the Terminal. There is a dedicated taxi rank outside the Arrivals Hall. A fully licensed bar and café is available in the Departure Lounge, after check-in. There are vending machines in the Arrival Lounge for visitors. Mayflower Park is an excellent vantage point to watch the ship sail. Ocean Terminal is about 400 yards from Dock Gate 4. Both Southampton Railway Station & the coach station are only 1 mile from Dock Gate 4. Southampton Airport is approximately 5½ miles away. Southampton is serviced by the M3 and M27, with the Port sign posted. Telephone Number: 023 8033 0730. A short stay car park is available for drop off and pick up of passengers. There is a dedicated taxi rank. A fully licensed bar and café is available in the Departure Lounge. Vending machines are also available.